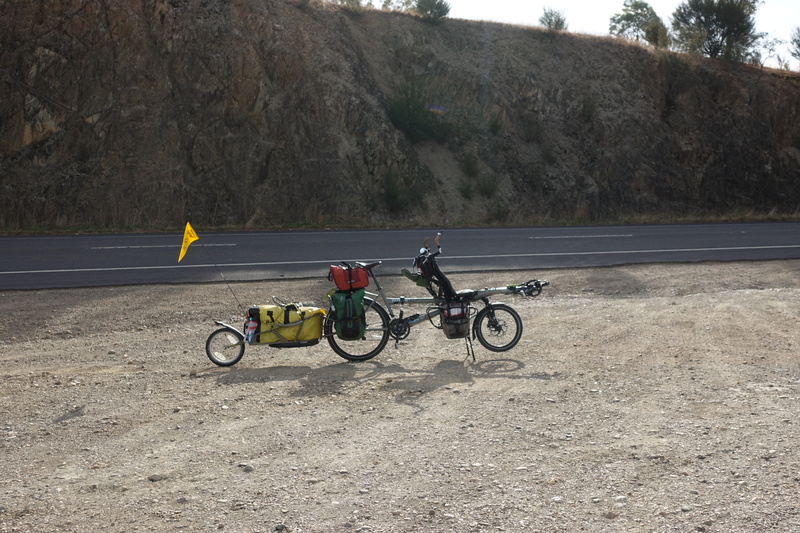 Once the bike was in ship-shape with its fixed handlebar and new chain, we set off in the direction of Brisbane. Kind of. First, we had to navigate Melbourne’s expansive sprawl, which took a complete day. We left our friend’s place near the bay and started on back streets to our first of many bike trails. These trails weren’t the most efficient way to get out of town, since they weaved through river reserves and underpasses, but the kept us off the busy highways until Lilydale, where we overnighted at a campground. That was also likely one of the most annoying cycling day this year – a full day of stops, traffic-lights, detours, construction, bridges, tunnels, zigzags through never ending housing neighborhood, etc. – we finished the day exhausted after only 65km (and still on the edge of Melbourne suburbs)! 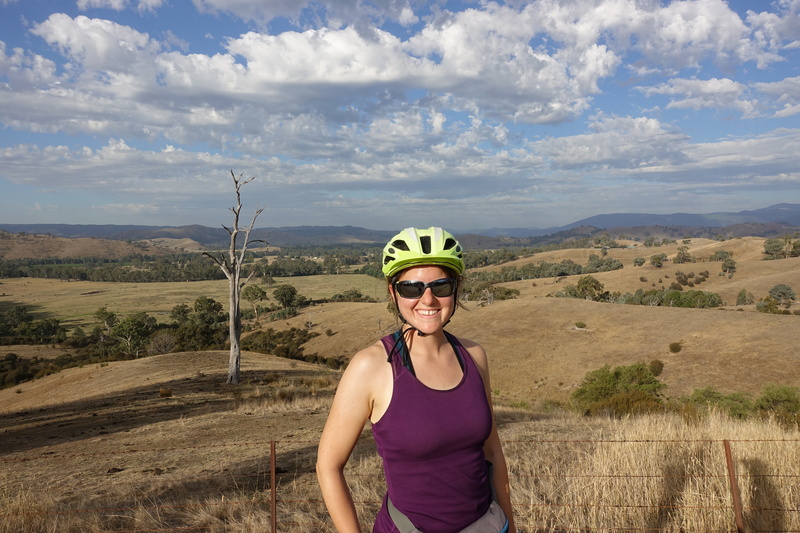 The next day, waking up to warm Indian summer-like weather, we finally had the feeling that we had escaped Melbourne’s suburbs and had the chance to cycle through the calm backroads next to vineyards in the Yarra Valley. Having cycled through New Zealand and now a bit of Australia, we are amazed with how pervasive the wine culture is – it’s not just limited to Bordeaux and Tuscany. We stopped over in the small town of Healsville to pick up food for the next leg of our travels. From there, we had an amazing ride up through Yarra Ranges National Park with gargantuan eucalyptus trees and ferns growing way above the road. 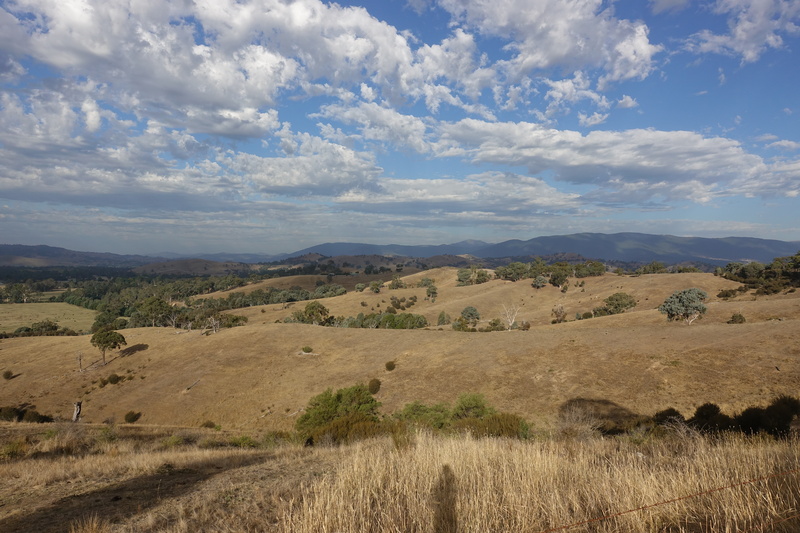 We continued down the Maroondah Highway into a dry, amber landscape and ended the day at a campsite in Alexandra with white cockatoos flying above our heads. Thursday, Cédric and I set off in the direction of Mansfield. 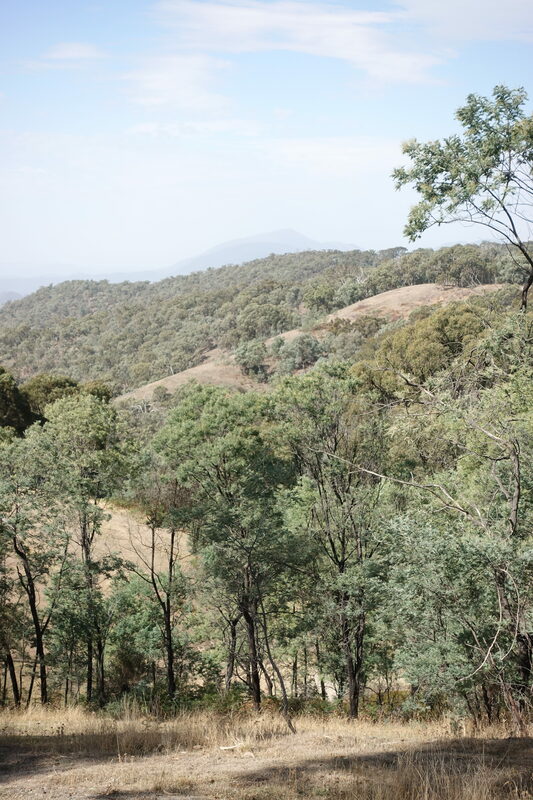 Instead of following the Great Victorian Rail Trail the entire way, we decided to take a shortcut through the mountains. The path we took for the shortcut, however, ended up being the wrong road (or better say not the most straight forward…), so we ended up biking up a 4WD path towards Lake Eildon – our shortcut may have saved us a few kilometers, but climbing up on dirt roads to the ridge of the tallest hills didn’t save us any time, not talking about suffering thighs. Once we reached the highway, we rejoined the rail trail into Mansfield. That night, instead of staying at a campground, Cédric and I decided to make use of the vast swaths of land and found a spot in a field tucked back behind old tree trunks and sun-bleached animal bones (from the size of the bones, probably horse or heifer). The serene settings allowed us to encounter some wildlife too, like foxes and jumping jack ants (large ants – too big to be good – that have a stinging bite, as Cédric will tell you). The next day included yet another larger climb over the mountains (we thought at least the Australian mainland would be flat), where we were pleasantly surprised to see other touring and road cyclists pass us by. On our way down from the mountains, we entered the King Valley, another region known for its vineyards. Catching a good tailwind, we ended the day early in Moyhu and had a nice swim in the campground’s pool. 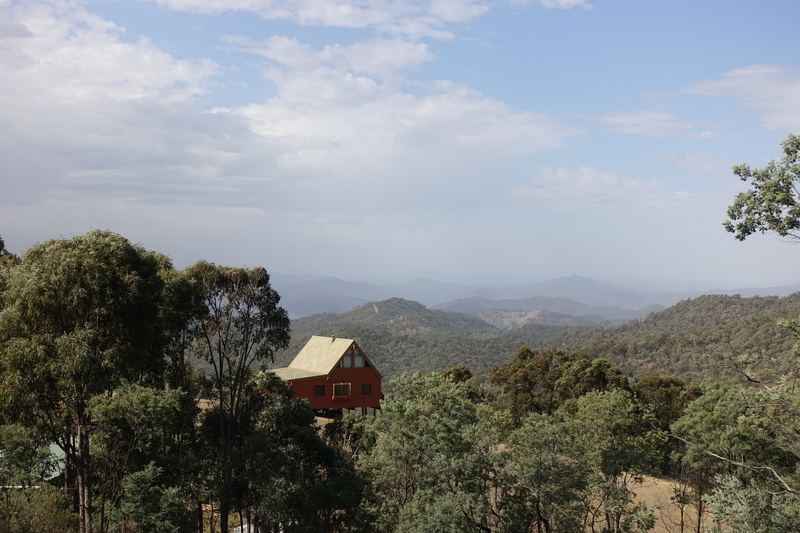 When we awoke on Saturday, the sun was shining, but the forecast proclaimed rain – so we packed quickly and cycled quickly towards Beechworth before the bad weather set in around lunchtime. The first part of the ride was unusually flat, so we celebrated our good speed with some quiche Lorraine from a local bakery and set off for the hillier portion of the day. From the town of Everton, we joined the Murray to Mountains rail trail which took us up a progressive yet never-ending slope into Beechworth (where we also saw our first echidna – a weird animal byproduct of evolution: a porcupine/anteater mix that lays eggs and has a pouch). The first drops of rain made us beat all our previous ascent speed records – trying to get our lunch in some place indoors. Just as we reached the well-preserved town, it began to downpour and the temperature dropped. We weren’t prepared for such drastic weather changes, especially the 20 degC temperature change, so Cédric and I sat in a café for a warm lunch and tried contacting some Warmshowers hosts in the area. To our luck, a family in Yackandandah came to our rescue with a last-minute request and told us that we would have a warm spot to sleep for the night. Once Cédric and I mustered up enough courage to face the weather, we biked the 20 kms in freezing rain (and possibly hail) to our hosts’ place in Yackandandah. Great encounter and a great relieve at the end of the day!